new types of human resource management are emerging: they propose making increased salaries and social promotion depend on individual skill assessment, which calls into question collective actions for defending workers’ rights, by individualizing career paths, or even competition within the company (Dugué, 1994; Linhart, 1994; Stroobants, 2003). 2These changes have an intrinsic contradiction within them: on the one hand, they officialize and promote collective work within the organization, and on the other hand, they very often make it very constrained and fragile. The emergence of these new forms of cooperation, and the organizational changes, pose specific problems of collective work (establishing a common knowledge base, building collective skills, information transmission, coordination of action…), particularly because the organization does not invest very heavily in them, and they are left to staff discretion. 3In this context, it is difficult for managers to draw out and develop collective skills, particularly for local managers who are often themselves included in the construction of these skills. Other difficulties also arise when appropriate training programs are set up, because it is time-consuming to develop these skills, and never trouble-free. 4However, professionalization actions do exist. They are often initiated by senior management, and aim to develop cooperation and communication within existing teams, and thus have an impact on some features of collective skills. For example, Mazeau (2001) underlines the role played by briefing and debriefing approaches, whose first aim must be to improve collective skills. Civil aviation training programs, known as CRM (cockpit resource management or crew resource management), focus on the operation of crews considered as homogeneous, and not just as a juxtaposition of competent individuals (OACI Circular 217-AN/132, 1989). In the navy, Cannon-Bowers, Salas and Blickensderfer (1998) also insist on the need for learning collective skills via “cross-training,” which consists of training each member of the team to deal with the jobs, functions and responsibilities of the others. Research carried out by Mundutéguy and Darses (2000), with an acoustic cell of an airborne team on a submarine detection mission, shows the importance of horizontal (peer) cooperation in developing strategies, drawing up a common operational reference system together, and sharing appraisal of the situation and the means, all of which are indispensable for doing the job. 5In this context, we want to shed some light on the corporate appraisal of one aspect of the collective dimension of skills (collective or distributed skills), related to the real way working groups are organized, to show just how complex the relationships are. Based on a study carried out within a large company that had set up a skills management approach (one of the many “managers’ workshops” (Segrestin, 2004)), we will show how an effective way of organizing work can be constructed collectively. The aim is not to target effective operation, or any particular work organization, but to show the different forms of collective work that underpin these operations, and the collective skills that help get the work done, using current performance and reliability criteria. The results of this study seem to us to contribute to a reflection on skills management by highlighting the importance of considering the collective dimension. This is because in corporations, skills management is mainly individualized, and so a team is seen as a collection of individual skills. We will see that, in point of fact, for individual skills to be built up, maintained, developed and meet production and safety requirements, they must interact with collective skills. 6In order to carry out this task correctly, we will first present the key concepts of collective work, and also of collective and distributed skills. We will then report on the study, focusing the analysis on the collective dimension of skills in three types of organizations: a maintenance team, an inter-service group on a production site, and an inter-site collective. This highlights three categories of workers and job descriptions with different production and safety objectives. Lastly, we will discuss the results in the light of the potential inputs that they could have in a more comprehensive skills management system over and above the three worker categories studied. 7Carrying out a particular job does not require only the skills needed for the task at hand; on the contrary, workers build up the skills that enable them to mobilize human, material and space-time resources, allocated by the company or built by the workers themselves (Chatigny, 2001), situated at various places in their environment (workers, teams, services, projects, levels of hierarchy, but also buildings, offices, HMI, procedures, etc.). Over time, with experience, within entities or in less permanent groups, they acquire metacognitive knowledge (knowledge about the properties and characteristics of people, jobs and strategies; Flavell, 1985), which allows them to access distributed skills within working groups. Through interactions, the members of a team learn what their colleagues’ skills are, and how often and to what extent they can call on these skills to carry out group actions. “There is collective action each time performing a task requires the coordinated action of several operators” (Leplat, 1993; p. 10). 9This collective action can take different forms (Falzon, Sauvagnac & Chatigny, 1996), depending on the intensity and the nature of the links between the members of a working group, and also on the degree of overlap of work objectives (whether or not they are temporary), whether the jobs are interdependent, whether there is shared work space, whether communication is face-to-face or long-distance, (Largier, 2005), or whether there is a shared work object (Barthe, 2003; De la Garza & Weill-Fassina, 2000). “a reference entity, to which the subject envisages a relationship of belonging” (Maggi, 2002; p. 29). The collective can then be superimposed on the work team, but this is only one of many possibilities (Maggi, 2002). 11Therefore, depending on how work is organized, the surroundings and the type of activity, collective work can take different forms and be partly based on collective or distributed skills. “One realizes that, in acquiring the required skill, operators acquire others. They learn more than they learn.” (Leplat, op.cit. ; p. 7). In the context of a collective activity, an informal allocation of tasks among the members of a team highlights the fact that skills are usually distributed between co-workers. 13In sociology, studies tend to concentrate on “the skill” and are along the lines of studies on qualifications; “in the idea of skill, there is something more than the notion of qualification. There is the idea of the employee’s responsibility to produce a result” (Reynaud, 2001; p. 10). From this point of view, the skill demands participation, it is about using autonomy, adjusting to specific requirements that highlight the worker’s own responsibility. The worker is part of a set of interdependencies that require cooperation (Paradeise & Lichtenberger, 2001). The skill can then be understood as the ability to mobilize appropriately one’s own abilities, but also the abilities that are spread around in the interweaving of relationships in which the work is set. For one thing, the skill is no longer confined to a series of tasks, but rather, for both the employee and the organization, it is a resource in the logic of action. For another thing, a skill no longer aims just to perform the defined job, but to adapt to changing situations, solve problems collectively, and achieve insertion in a socio-organizational fabric. 14This collective dimension of building up and using individual skills then raises the question of collective skills. “Without falling into the myth of the ”collective worker,“ one can make the assumption of a collective skill and its origins, when, within a team, information circulates, representations become more uniform, know-how is interlinked, reasoning and strategies are worked out together” (Montmollin, 1997; p. 99). 15From a social point of view, Reynaud (2001) considers that the collective skill depends on the context and the industrial sector, and it is obvious that the collective skill of a mason in the nuclear power industry would not be the same as that of a mason in the construction sector (Célérier, 2005). Collective skill is treated generically. In this context, it is acquired within a structured group, and depends, among other things, on the quality of the interactions and the ability of the workers to share their knowledge and skills (Bourrier, 1999). “on an intersubjective understanding that is shown by verbal and non-verbal behaviour, mutual beliefs in the others and presuppositions about the understanding of the situation” (Mondutéguy, Darses, 2000; p. 172). “the capacity to interlink one’s expertise and job skills with those of others” (p.50). They have a life of their own (Leplat, 2000); they transform situations and individuals, and are themselves transformed over time. 19Other studies help us to define the nature of these skills. According to Rogalski (1998), two types of skills coexist, one based on knowledge about the object (“reference knowledge”), and the other relating to knowledge of how intra-group actions interact (“doctrinal knowledge”); this second type of skill seems to correspond to collective skills. This approach is similar to studies by Terssac (1996), Cannon-Bowers et al. (1998), and also Grosjean (2000), which all show that these skills depend, respectively, on “knowing how to collaborate,” and on the process of coordination or interacting, referring to the studies by Strauss (1992). They emphasize the implicit nature of these processes, that is, they are invisible in work organization, and very often ignored, because they are poorly understood or not analyzed at their true worth. Research carried out in the hospital sector by Grosjean and Lacoste (1999) shows that collective skills depend on the group’s knowledge and skills being coordinated, on “professional worlds” (related to different professions), people, resources and actions, for patient care, and, by extrapolation, for carrying out a collective task correctly. or who try to impose their point of view on others. So collective skills are built up within a set of social workers, over time, and in a non-linear way. “human procedures for overcoming the limits of the individual cognitive process” (Conein, 2004; p. 57). 23From this perspective, our approach focuses on skills and not on cognition, using the model for sharing skills and knowledge between different workers and professions. This distribution of skills is then part of a social network of professions and statuses (Larquier & Salognon, 2004). It should be understood that this can go beyond the boundaries of one company, and exist between different companies (Allaire, 2005). Obviously, as in the case of collective skills, this is based on building up individual skills; however, in the particular case of distributed skills, the organizational structure has a determining influence in the possibilities for building them. This is because, as Boily (2006) points out, a strategic priority for companies is to recognize, first, and then to encourage the role of “communities of good practice” and “social networks.” The aim is to identify forms of organization that make it possible to create networks for exchanging and sharing knowledge and skills between relatively isolated experts. This enables sharing through feedback, identifying complementary skills, and improving each other’s practice. The “mutual help networks” can change into “micro-communities” within which the workers share “the same cultural background and identity, the same roles and functions in the company” (Metzger, 2005; p. 256), which facilitates informal contact. In this case, the social and skills network is fairly horizontal. However, the social network can be more or less extended and can depend on forms of management, and can be both horizontal and vertical. So the existence of distributed skills can be seen in connection with resources developed within a specific organization employing people with very different jobs and statuses, and distributed in different parts of the organization, similar to what has been described for design plateaus (Renou, 2003). These resources are mobilized in order to enable optimal, effective and reliable functioning. 24One thing that collective skills have in common is that they share a common work objective, although possibly a narrower one, and share, if not a common operating reference, at least a representation of the work situation. A minimum of shared understanding about the type of problem in a work situation to be dealt with is vital for communicating, talking and working (Langan-Fox, Wirth, Code, Langfield-Smith, Wirth, 2001). This is all the more important in that, in the context of distributed skills, employees do not necessarily act at the same time, and their actions in the work situation may be independent. 25Distributed skills can be brought together by the organization itself, by creating exchange networks and particular forms of management. In order to use distributed skills, these (official or unofficial) networks need to be functioning properly, because they are strongly interdependent, which is not the case for collective skills. 26These two types of skills are enhanced by the employees’ experience. They change over time and are dynamic. However, collective skills are used in a fairly synchronized way by the various team members, and develop in the action, as the work progresses, whereas distributed skills can be built up out of synchronization, during network exchanges. This is a particular feature of distributed skills. They are activated from time to time within the network, or even completely independently from the network, whereas collective skills are activated more permanently within a team or a working group. Collective and distributed skills may coexist in some cases, but, in other cases, only one of the modes is possible, given the specific way the work is organized. 27Although there seems to be no doubt about the importance of collective and distributed skills for carrying out joint tasks, it appears trickier for the company to take these skills into account (Cavestro, Colin & Grasser, 2007). We will show that the recognition of these skills and their deployment by the workers is considered differently by the organization, depending on the “organizational segments” (Alter, 2000) in which the collective activity takes place, and depending on the time frame in which the management of these skills is placed. Moreover, for the same job or set of jobs and for the same profession, the collective skills that will be built will differ from one context to another, because their main objective is adapting to the work situation and to its organization, in order to meet production and safety requirements. 28After a short presentation on the company and the departments in which the study took place, we will attempt to describe and analyze how collective and distributed skills are taken into account according to different ways of organizing the business and working groups. “of material, human and symbolic elements, in systemic interaction with each other in order to organize human activities, and in particular work activities” (Boussard & Maugeri, 2003; p. 36). 30The company has central departments, functional departments, technical support, engineering and R&D departments, and about twenty sites. All the sites have a similar general organization, characterized by a set of functional departments (human resources, communication, reception, site protection, etc.) and operational services for steering and maintaining the production tool. Two projects run through the organization of these sites, in which all the operational departments have representatives: the “production line in operation” (PLO) project, and the “production line in downtime” (PLD) project. For the company, these two projects allow for detailed planning and organization of the activities and help limit the effects of partitioning between departments. 31As a last point, the objective of transverse structures is to carry a particular theme, to set up measures, facilitate communication, etc. Thus, each site has a Skills Development Group (SDG) that aims to enhance collaboration between employees affected by skills management in different departments, and that allows the HR department and central departments to ensure that needs for skills are properly identified and that the different professionalization actions are used. 32This study involved the use of skills management tools within departments responsible for using and maintaining the production tool. It focused on how the various skill management tools are used for three types of employees: Engineers Specializing in Sensitive Materials, (ESSM), Local Managers of a maintenance department (LM), and “supervisors” of contractors working within the PLD project. These employees were chosen because their skills are management, steering and support, which are not the typical “technician” skills that are usually studied. They also have different statuses, varied skill domains, and are part of different groups or organizations. These three types of employees enable us to discuss different facets of a skills management plan. 33The objective was to make a diagnosis of the current skills management plan, and to see how well it matched the real life context of the professions and the work. The results showed, among other things, that collective and distributed skills exist which, although they are not the direct result of the skills management plan, appear indispensable for thinking about corporate skills management. 34The investigations, carried out on three sites of one company over a two-month period, enabled us to create a binder of technical or regulation documents, semi-directive interviews and observations in the field. The sociological analysis (Boussard, 2001) of the management plan that was set up aimed to show the interplay of employees. There are two main advantages of the interdisciplinary nature of our research: one is going beyond the work situation to take into account organizational and political issues, and the other is the intention to produce detailed knowledge of situations studied “with a view to transformation” (Caroly & Cholez, 2007). 35Data collection was carried out in two stages. First, the central departments presented their HR management policies and the existing skills management plan. At that time, we met the heads of HR and training. 36Then, our research was carried out on the company sites where we made observations in the field and had semi-directive interviews. Once the skills were finalized, they were defined from the work itself, which presupposes a bottom-up analysis (Leplat & Montmollin, 2001). Global work chronicles (Rabardel et al, 1998) were prepared from open, continuous observations of the activity on the three sites, and cover 21 half-days on site. During the observations, we tried to describe: the allocation of jobs and skills in relation to internal site organization, the requirements for these jobs, and the activity used to carry them out (communications, meetings, maintenance operations, organization and preparation tasks…). 37During the semi-directive interviews (Blanchet, Ghiglione, Massonat & Trognon, 1987), the aim was to get a better understanding of the professional careers of the employees, the types of jobs they were given, and the way they saw the management of their skills and/or the skills available in their department (see Appendix 1). Since our aim is to analyze the skills management system, we defined beforehand the major functions of managing this type of system: identifying and listing the necessary skills, assessing the skills available, defining and setting up professionalization actions. For each of these functions, the sociology and ergonomics literature provides avenues for exploration. For example, Oiry and Sulzer (2002) emphasize the importance of skills reference systems in this management system, and show that these systems of reference can never be exhaustive, which calls their use into question. In the same way, many authors underline the paradoxical nature of these management tools that aim to individualize professional paths (Paradeise & Lichtenberger, 2001) while emphasizing cohesion, cooperation and working groups (Cavestro et al., 2007). It is only progressively, through the answers obtained, but also when examining the various modalities of professionalization, that the collective and distributed nature of skills seemed to us to be an appropriate perspective for analyzing and understanding the situation. 38As well as the three categories of employees considered (Engineers Specializing in Sensitive Materials, (ESSM), Local Managers of a maintenance department (LM), and ”supervisors“ of service providers), we also interviewed hierarchical superiors, peers, subordinates and heads of training or HR on each site. Each ”case“ was studied only on two of the three sites so as not to overtax the departments, while going beyond looking at a single case on a single site. 39In the end, 70 interviews were collected. Table 1 shows the number of interviews carried out with local and national employees for each category. 40The results show forms of collective skills and distributed skills used in collective networks that may be, to a greater or lesser degree, extended or local, stable or temporary, or internal or external to the company. Collective and individual skills management makes sense only in specific professions and contexts, even if these collective and distributed skills share a common objective: to meet production and safety needs. 41Analysis of the characteristics of the 85 LMs, identified as such by the company, shows the wide differences in the group. They can be 26 to 60 years of age, and 53% (45 LMs) are 46 or over. About 50% of the group will be replaced in a few years’ time. Their educational level depends on their age: 82.5% of the 26-45 year-olds have a bachelor’s or master’s degree, compared with 31% of the older ones. They are not evenly distributed around the production sites. In some centres, there are only two LMs, or just one, whereas there are up to 13 on other sites. LMs can have different statuses, foreman or middle manager, and broader or narrower functions depending on their particular workstation (e.g., method vs operation). 42This difference in status and function, and the diversity within the group and the difference in spread over the sites were found on the two sites more specifically studied. We were faced with four types of job descriptions coming under the general heading ”LM“ in this company. This suggests that one important feature of an LM comes from the fact that it is a very elastic position, depending on status, with the common denominator being an active combination of a maintenance job with management functions. 43Our field studies show that the organization has a direct relationship with the status and functions of LMs. We will illustrate this with cases studied on the two sites. 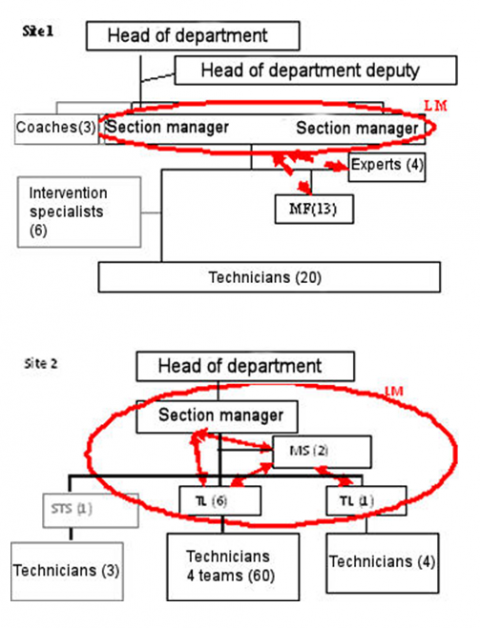 The first site has an organization in which the LM function is currently covered by two people (Section Managers) working closely with 4 supervisors known as ”Experts“ and 13 foremen (see Figure 1). 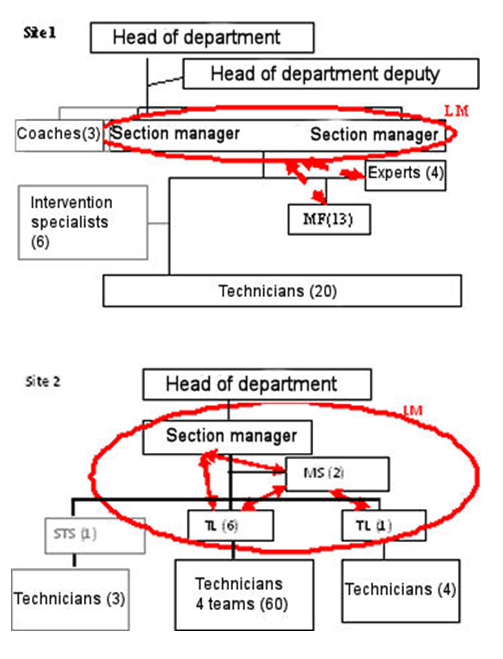 On the other hand, the second site has set up a network in such a way that the role of LM is covered by a Section Manager (SM), 7 Team Leaders (TL) and two Management Support people (see figure 1). In other words, through these relationships, we show totally essential collective work, both for the different people who work as LMs effectively and safely, and for the overall safety of site operations. 44In the first organization, the two Section Managers (SM) share the missions to be carried out, and delegate very little to their subordinates. They need both technical and managerial skills to do their job. They have a common skill set, although certain specializations exist and, according to the interviews, are explicitly related to one of them preferring the technical aspect and the other the managerial. 45In the second organization, the SM delegates the daily management of maintenance operations, teams, schedule, technical incidents, etc., and validates the decisions later. The TLs cover the technical area, while the Management Support (MS) people deal with the mid- and long-term management of the department. The SMs make the strategic decisions, but often depend on the MSs who are closer to the grassroots. The SMs steer the section, working with the 2 MSs. The function of LM is spread over 10 people, and all the necessary skills are more distributed over all the workers at different places in the hierarchy. Although everyone does not need technical or managerial skills (in this latter organization because of the distribution within the working group), the work of interconnection needs to be in place. On both sites, LM networks exist, which have the particular feature of being built up according to status: on both sites, the SMs belong to a network of intersite LMs, and on the second site, the internal network of TLs is being revived. The job of these networks is to facilitate communication between workers with identical status, and there is no possibility of interactions between people with different statuses doing the same job. 46The point here is not to say that one way of doing things is more effective or more reliable than another, but to show the skills management needs of LMs, not only in terms of skills but also in terms of organization. A person whose career path has been within the company (on one site or different sites), going from a technician to an LM, going through local management positions. These managers who have come from the grassroots tend to stay longer in the job, because the job is an endpoint of their career. The company looks for people with the potential for progress, and gives them mandates. This is the case for the two LMs on site 1, who have come from the grassroots, one with a high school technical diploma and the other with post high school training as a technician (BTS), one who has worked there for 23 years, and the other for 25. A person who comes into the company directly, or almost directly, after higher education. These are young managers who stay in the job for 4-5 years, then progress to middle and senior management jobs. However, it is important for them to start with other jobs. For a department head, putting a young manager in an SM job is the best way to see what she/he is capable of. This is the case for the SM on site 2, who is an engineering school graduate, has been working for the company for 4 years and is in his third position. 48These two profiles show the two generations of LMs: in the first group they are older, with lower educational level (mostly lower technical qualifications or middle school diplomas), are experienced technicians, know the history of the company and learned their managerial skills as they went along. In this case, the LM job is usually the summit of their careers. The second group is younger, with a high level of education (master’s or equivalent), trained in technical processes or corporate management techniques, and the LM job is a springboard for a career in the company or elsewhere. However, it seems that the first of these two profiles is gradually disappearing, because this generation of employees is nearing retirement and the company wants to encourage organization based on the site 2 example on all sites. 49On site 1, the collective skills and organization are based on technical knowledge, knowledge about the installations and their history, together with the management skills of the two LMs. In this case, the skills depend on a collective as defined by Clot (2002), namely one that does not necessarily overlap with the work team, and of Cru (1995), namely defined by the activity and co-constructed in action. On site 2, with a larger number of employees, the skills are distributed between some more technical experts and others who are more specialized in management. They are more like a network as defined by Boily (2006). In the second case, the branched structure of the LM function also presupposes the existence of collective skills enabling interlinking of the actions of the different employees holding this position. 50We can therefore say that the skills distributed within a department are taken into account and handled by the management, since recruitment and organization are partly done in accordance with the method of skills distribution, particularly on site 2. However, the collective skills present in the organization, which depend on interaction, and the actual work activities, are never named by the company, and are left totally to the discretion of the departments and workers themselves. However, they are very likely to disappear when people retire or leave. 51In this company, the decision to outsource a large part of maintenance was made in the ’80s. The objective was to improve the quality and safety of maintenance activities, particularly through better ownership of outsourced operations. A ministerial order dated 1984 decrees that activities where quality is supervised must undergo technical verification by the main contractor and surveillance by the owners for services carried out by outsourcers. An extract of the company ”quality manual“ specifies that surveillance must make it possible to ”ensure that the outsourcers respect requirements and control all aspects of the quality of the intervention,“ i.e., the security, costs, duration, work conditions, waste management and the cleanliness of work sites, etc. 52The supervisors carry out their activities within the PLD (Production Line in Downtime) project outside their home-base department. The group is made up of technicians and foremen from technical departments. Since this is not really a company position but a temporary mission, the group of supervisors is not monitored as such, and the company does not have exact figures as to the age distribution of the supervisors or the number of years on the job (which is recent in this form) or their original profession. 53On the sites we studied, the project team that the supervisors work on only exists temporarily for the project’s lifetime, which can be from 1 to 5 months. According to company documents, the mission covers many different fields: technical-commercial relations (cost/quality ratio, cost control, ability to cope with unforeseeable complications); the means used (technical and human; authorizations, abiding by the laws…); quality organization and the ”safety culture“; ecology (clean sites, waste and release storage); technical quality of the product and lead times. 54For this, the company documents specify that, before the service is performed, the supervisor must: be familiar with the specific system of reference for the intervention, ensure that the outsource is capable of respecting requirements, draw up the surveillance programs; direct the meeting for prerequisites. to stop the intervention if there is a quality or security problem, and inform the person in charge as soon as possible. to take steps if anything does not conform to the contract requirements due to the fault of the service provider, or to the contract definitions for the intervention. 56After the service, the supervisor is expected to assess the service provider, draw up the surveillance report, and take part in the various debriefing meetings. 57Surveillance must ensure that the service providers do their jobs while respecting the procedures defined by the company, and more specifically, for the site. These procedures should themselves meet the requirements summarized in the areas listed above. For example, if an intervention has a fire risk, the supervisor must ensure that the service provider has followed all the procedures so that temporary firefighting measures and equipment are in place: the fire permit filled in and present on site, and protections that meet specifications. However, the supervisor’s mission is not to control the quality and the effectiveness of the firefighting measures and equipment. This is done beforehand by another specialized department. 58The job of the person in charge of surveillance is one way to meet the general objective of surveillance. Other departments also have a role, such as the medical department or the safety and risk prevention department. They can interact with the supervisors who must include their remarks when they write up the surveillance report. 60Supervisors draw up their surveillance program working alongside the project leaders (top technicians or foremen seconded from maintenance to manage the job within the project) and the preparers from the departments corresponding to the job. Also, since the supervisors come from different technical departments, they do not have the same technical knowledge. It is vital for them to talk together, help each other, and sometimes adjust the surveillance plans together. Some sites have set up supervisor networks to facilitate cooperation and consequently the deployment of the distributed skills that are useful for surveillance. On one of the sites where we carried out the study, the network met once a week when one of the production lines was stopped. These weekly meetings are where agents’ job problems, needs, etc., are identified and dealt with if possible. 61Given the conditions in which the activities take place, it is difficult to build up a specific skill, which is broader than the skills associated with each profession, based on collective practice, and developed over time through many frequent interactions. This is because the jobs are monitored by project leaders who are seconded by the same departments as the supervisors, and who are often presented as the ”eyes and ears“ of the project leaders. Each job is therefore monitored by people from the same department and who are working with people who have stayed in their original department, which does not help in breaking down the partitions. There are not many discussions between supervisors that help build collective skills. 62However, deployment of distributed skills within a site is an integral part of the activity of surveillance. Supervisors must know which people to deploy and in which circumstances. These specific skills, which are skills for deploying skills, do not seem to be taken into account as such in the skills management process. These skills are partly built up within the supervisors’ network and make for the interaction of professional worlds limited by their fields of competence and hemmed in by contracts. They do not appear anywhere in the reference systems or in the different skills management tools (skills maps, business reference systems, assessment grids, etc.). However, most sites create internal contact lists specifically for production downtime, to help carry out activities that need particular skills. 63Therefore, skills distributed amongst entities on a single site are taken into account through the existence of peer networks and devices for finding skills (the contact lists). However, surveillance skills are not managed together as a whole, which is needed for carrying out the job correctly. Contrary to what is practiced in the departments, the PLD project structure has no one in charge of skills management who could try to identify the available skills in order to find what is lacking for setting up appropriate professionalization actions. Within the sites, there are no tools for identifying individual needs for particular skills in certain areas of surveillance. In the same way, the use of these skills is not monitored in real time, since skills management is carried out in the departments, whereas the mission of surveillance happens during secondment to the PLD project, away from the managers. So skills distributed between departments are taken into account via the peer network and the aids to deployment, without these skills really being managed. 64The case of supervisors is different from the previous case for a variety of reasons, while presenting a collective dimension, which, in daily activity, enables work and safety management. This is because, on site, the supervisors depend on the skills of other employees, such as project managers, to carry out programs. The supervisors then build and feed their skills in a relationship with a network of supervisors. However, contrary to the case of LMs, these distributed skills possessed by the different supervisors are built up in a way that is not in synchronization with the work activity. 65This supervisors’ network brings us back to Boily’s idea (2006) of ”communities of practice“ that give rise to strong relationships through the exchange of good practices. However, although the network is a form of organization that contributes to setting up and deploying distributed skills, it in no way guarantees that they will be effectively and efficiently used in a work situation. This depends on both the supervisors and the internal validation of the effectiveness and usefulness of these networks. Therefore, although this network functioning can encourage the emergence of distributed skills, in the context studied, the weight of the professions in how job monitoring is structured limits the opportunities to interact with people fulfilling the same mission. 66Each site in this company has an engineer specializing in sensitive materials (ESSM). These materials, which are vital to process functioning, present a risk for employees who handle them and for the installation itself, because they are unstable. Under certain conditions, they can damage the production lines. 67There are not many ESSMs (19). Analysis of socio-demographic data shows that more than one third of ESSMs are over 44 years of age, and only three are under 30. Most of them are experienced people who have held other positions in national engineering units, on sites or in other companies. However, for four of them, this is their first job, which they have had ever since they left engineering school. 68The ESSM’s field of action goes from receipt of sensitive materials through to their disposal, including the different stages of use: preparation, monitoring the use, and storing the used material before redispatching. The role of the specialist engineer is to support the operational departments and steer projects involving sensitive materials. The ESSM is also in charge of applying, locally, instructions for using sensitive materials. According to the employees interviewed, a great many skills are needed, and they take a long time and are difficult to learn properly. So it is rare to find an ESSM with the same level of competence in all the possible areas of activity. 69As well as computerized tools for calculations and simulations, the ESSM has a space on the computer network, structured according to the skills referential, which is used for filing documents and as a communication forum. The forum was recently opened to certain members of national engineering units who work with specialized engineers. 70The ESSMs are part of an organization known as a ”mesh,“ which is a genuine peer network for staying in contact with their counterparts on other sites and with the national engineering unit for sensitive materials. The mesh, as a relational structure, can be seen as a two-level network. 71There is the close network run by a moderator from the national engineering unit for sensitive materials. He connects all the ESSMs from the sites and the experts from the national engineering unit for sensitive materials. This makes it possible to provide technical support to specialist engineers who need information, and also to share experiences from different sites. The moderator is not there to manage the skills corresponding exactly to the activity on a daily basis. That is the role of the department head. However, the moderator does take part in the skills management of the ESSMs in the medium term by, among other things, writing up the specifications for requests for training, and creating a professionalization pathway. 72The second level of the mesh also covers other structures of the engineering department and expertise. This is an extended network. The people in this extended network are not directly accessible to the ESSMs on sites, but they can be contacted via the engineers in the national engineering unit for sensitive materials. Consequently, ”structural holes“ (Burt, 1995) exist that the ESSMs can sometimes fill, thanks to their personal contacts and contacts made during their careers. 73For their activity on site, ESSMs will sometimes need to call on people off-site. The skills needed to do the job are shared throughout the entire organization: according to a manager from the ”sensitive materials“ branch of a national engineering unit, some 230 people have these skills, out of a total of several tens of thousands of employees. These skills can be considered as rare. ESSMs are expected to give specific answers to questions in their field coming from colleagues. Their skill will then depend on the degree of organization of these professional networks, their durability, and the possibility that the ESSMs have of contacting the right people in the company and of using the skills distributed throughout the organization. Figure 2 below illustrates how these skills (Si, where i is from 1 to 7) fit into a professional, inter-unit network. 74The skills in the network raise questions: To what extent are these ”skills for deploying skills“ taken into account, identified, developed, evaluated? Over and above ”knowing how to act“, to use the Le Boterf (1997) model, the skills also refer to ”being able to act,“ that is, using the organizational provisions that enhance the use of the person’s own abilities, and also other people’s abilities, for doing the job. ”skill is just as much distributed in its construction process as in its future operation“ (Masciotra, Jonnaert & Daviau, 2006; p. 5). 78Management of these particular skills, which are firmly embedded in a professional network, is at least partly outside the limits of local management. These distributed skills, which are acquired over time, can only be learnt as the engineers progress along their career paths. These skills are therefore identified nationally, and the company has seen the need to manage them at a national level through career progress and professional mobility. However, this concern to take a fairly long-term view of skills management is made more complex by the ambitions of the candidates and by the rarity of the skills. 79So these skills distributed outside the sites are taken into account by the company, but their management is much more broadly based than the local sites, even if skills management is supposed to happen within the departments, at a grassroots level. 80In this case, the distribution of skills happens within an extended network, spilling over the borders of the departments and sites themselves. This is largely due to the fact that not many people have these skills and that the skills themselves take a long time to acquire and are difficult to master. Management of this type of skill highlights an extra dimension compared to the two previous cases: this management is embedded in a broader time frame, and it interacts with a career path that the company wants and values. the ”layout“: Who should work with whom? the characteristics of ”the work situations“: What are the work situations that make it possible to develop and use the skills? ”organizational resources“: What are the technical means, objects, information and rules that enhance the relations between people and the sharing of past experience? 82From this point of view, we will discuss in particular two main thrusts here. 83One is that it is impossible to think about a skills management plan without taking into account existing organizations and forms of management that can be associated, depending on the particular context of a site. 84The other is that the present skills management plan is built more on the development and anticipation of individual skills, whereas the results show that collective and distributed skills are at the core of the three businesses studied. Furthermore, it is these skills—collective and distributed—that appear as a guarantee of reliability and performance. We will try to make some recommendations along the lines of this double perspective for the skills management plan that we have diagnosed. 85A skills management plan cannot be drawn up in the abstract; to be more effective and better adapted to corporate needs and changes, the inclusion of human resources management and relevant organizations has been proven vital, depending on population profiles, work contexts and the skills themselves. 86As in other sectors of activity (Pueyo, 2000; Gaudart, Delgoulet & Chassaing, to be published), we note that LM profiles change as the person ages, and consequently, the initial training and career path. This change needs to be associated with types of organization and management directed towards setting up distributed skills, but that still interact with collective skills. However, this also depends on the size and needs of the site. Thus, setting up local networks, which encourages the development, maintenance and progress of collective and distributed skills, can be integrated into the thinking about a national plan, and must then be studied case by case for effective and reliable deployment locally, in association with the needs and changes in profiles. 87The case of surveillance supervisors highlights specific difficulties for the skills management plan in following employees, because they carry out temporary missions. Thus the reliability and performance of the socio-technical system relies on distributed skills at both the local and national levels, associating other professions and peers. So the plan should take care to maintain and recognize these networks that contribute to the building of good practice communities (Boily, 2006). But the skills management plan is not enough, because the organization and the management need to carry out and validate these networks to ensure that the different workers are motivated and that adequate resources are available. Among other things, perhaps some thinking needs to go into the follow-up of the population of surveillance supervisors, because their skills (although they do not need to be able to perform technical ”acts,“ as the experts themselves admit), are based on important quality control skills. Also, one needs to be able to assess, find and deploy the skills that are vital to carry out production safely for others. From this point of view, the skills management plan seems inadequate here. 88The greater the distribution of skills between entities (departments/project, sites/national engineering units), the more the departments lose control of the management of distributed skills. In the end, the local managers are the ones for whom the organization is best adapted to the profiles: teams of local managers with complementary skills are interesting from this point of view, but they cannot replace a skills management plan. 89Conversely, the more the skills are distributed between distant entities, the greater the time needed to acquire the skills, and the more the employees themselves are counted on to build these network skills. 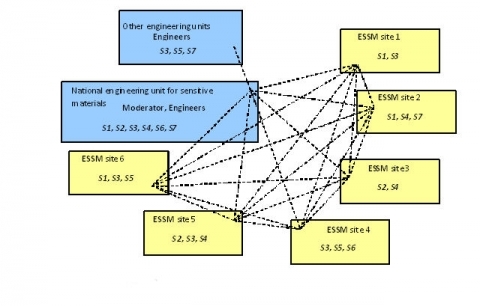 This is the case for the ESSMs, for whom the organization manages career paths in such a way that the specialists hold different positions and build their networks. But there too, the role of the organization is fundamental in validating and supporting this national network and making it more explicit as a skills management tool, and in particular for developing distributed skills. 90Skills management differs depending on how these distributed skills are allocated. The specific nature of these skills, which are rare and long to acquire, influences the way they are distributed and the time frame for skills management. The time frame for managing these distributed skills changes according to the organizational dimension to which they belong. It moves from local and almost daily skills management, to national, long-term management. 91The difficulty for the organization lies in matching this type of skills management with the daily management done in the departments on the sites. This is because when skills management is done in the departments on the various sites, this complicates setting up a strategy for acquiring skills through planned national mobility, i.e., setting up real long-term professionalization ”railway tracks“ (which does not exclude ”points“ for changing tracks). 92For example, we noted that peer networks existed for the three professions we studied. However, these networks do not have the same role or the same impact on skill development. In the case of surveillance supervisors, and even more in the case of ESSMs, the network is a special place for developing individual and distributed skills. However, for LMs, the network is more a place for communication and sharing experiences, without having a decisive impact on the building of collective skills, because the networks for the two statuses of LMs (foreman vs manager) are dissociated. 93Skills management has to be done by connecting the local level to the national level, in order to associate reference systems, accreditations, etc., with HR management and adapted organizational thinking. The objective here is not to prescribe more cooperation through systems of reference for collective skills, because Cavestro et al. (2007) and particularly Richebé (2007) have shown the limits of these: the ambiguity of assessing and recognizing the individual’s contribution to the group; and the difficulty in contractualizing tacit knowledge and skills that are strongly linked to informal and uncertain social communication. However, comprehensive skills management should link together the individual and collective viewpoints, for the following three results: planning for organizations that encourage the development of distributed and/or collective skills; promoting work, communication and training situations that encourage the building up of these skills; and identifying ways of working (rules, procedures, technical means, etc.) that encourage common experience that can be passed on. 94In the case of the LMs, it is easy to imagine that the organization of the second site would not suit LMs with a ”senior“ type of profile, who have very solid technical and ground knowledge. In the same way, the organization of the first site would not suit a young LM. The impacts are felt in the management of both production and the safety of the installations. So the stakes are high for a skills management plan in this type of company. 95Skills management is closely linked to career progress, and this can have a positive impact, or it can make skills management more difficult, as in the case of ESSMs. It is therefore vital to anticipate new or different fulfilling changes so as not to lack specific skills, which are complex and long to acquire. The three cases studied show how a skills management plan within a single company cannot be ”unique,“ but must have different versions depending on the context, specialty, staff changes, technological advances, etc. The study also shows that this plan cannot be designed without also considering work organization. According to the authors of the HRO (High Reliability Organizations) school, one of the criteria of the reliability of organizations is the importance of training, and thus skills management (for example, Roberts, 1989, 1990). Moreover, for the organization to be resilient (Weick, 1993), it must be able to adapt or change according to changes in knowledge, staff, training, etc. 96This is why skills management cannot ignore the organizations in which the skills are or will be deployed, or the profiles (age, career path, experience, career changes) of the staff who have these skills. The authors would like to thank Nathalie de Beler and Pierre Letzkus who helped with the field studies. Cannon-Bowers J.A., Salas E., Blickensderfer E. (1998). The Impact of cross-training and workload on team functioning; a replication and extension of initial findings, Human Factors, vol. 40 n° 1, p. 92-101. Roberts K. (1989). News challenges in organizational research: high reliability organizations. Industrial Crisis Quarterly, vol. 3, p. 111-125. Weick K. (1993). The Collapse of Sensemaking in Organizations: The Mann Gulch Disaster. Administrative Science Quarterly, 38(4), 628-652. Otherwise: a description of the relationships with the people who do the job. What: Identify and choose skills that make it possible to build reference systems and maps, taking into account non ”technician“ skills and collective skills. How: Ways of identifying and analyzing the job, what people and sites take part in drawing up the reference system and, inversely, to what extent the documents received are understandable, suitable and useable. Local application of Forward Planning of Careers and Skills Management (GPEC). Taking account of career paths and setting up reorientation possibilities. Relationships between departments and sites to manage movement (internal mobility). Taking into account major changes (organizational changes, renewal of skills, ageing of installations and staff…). Identifying critical staff, skills and technical areas. The characteristics and forward planning capacity of provisions for monitoring staff changes. Local needs and how they apply at a national level. Incorporating national issues in expressing local needs. The existence, ownership and usability of provisions (tools and organization) for managing these needs. Choosing between the possible answers to a need for skills in the case of technical changes, or in the case of a vacant position (if someone leaves or a new job is created). The amount of choice that the site itself has, with respect to national constraints. The specific skills of trainers, workmates, recruiters. Means used to acquire, maintain and develop skills: Are they sufficient and appropriate? Ways of acquiring and maintaining skills, how the different types of possible solutions are complementary. How well does the answer meet the need? Local/national interfaces in setting up training. Local or national technology watch for (new) types of training. Assessment after professionalization actions (how well did it meet the need?) and also at regular intervals to determine a possible need. Assessment of skills in the field, during the job. Means (auditors and their assessment criteria) and methods used for assessing acquired skills. How these assessments are carried out: Are the assessment criteria consistent with the contents of the reference systems? Traceability of assessments (existence and modalities). Giving, extending and withdrawing accreditations. Local/national interfaces for accreditations (identifying ”accreditable" activities and how the accreditations are given, renewed and withdrawn). Is it right, problematic, justifiable to have differences between sites?